Home » Althouse » Is Google programmed to teach us not to write "Democrat Party"?! In a post earlier this morning, I noticed the congressional Democrats have something called "New Democrat Coalition" and wondered why they accepted using "Democrat" like that when they adamantly oppose "Democrat Party." It's a coalition of Democrats, so Democrat Coalition is fine grammatically. You can use a noun as an adjective when it makes sense. It's the Optimist Club, not the Optimistic Club. Why rankle at "Democrat Party"? And why think you're insulting them by calling it the "Democrat Party" — other than that you know they're annoyed? 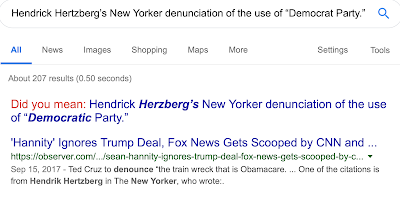 One of the funniest things I’ve ever read is Hendrick Hertzberg’s New Yorker denunciation of the use of “Democrat Party.” That’s what I call it now. 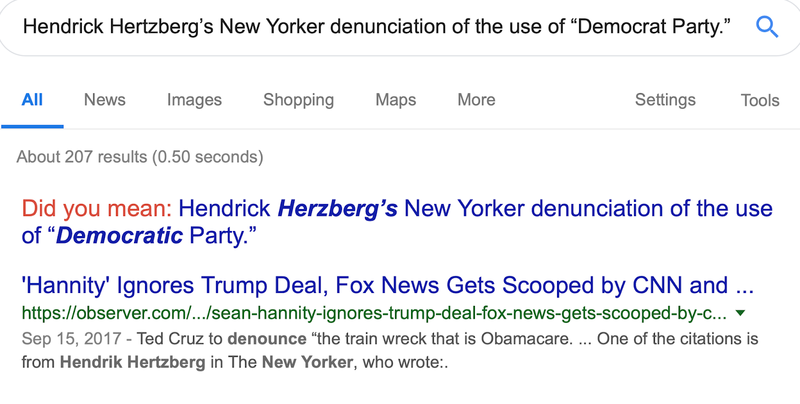 Does Google busybody itself into all the searches that say "Democrat Party"? And what's up with prodding me about the part of Hendrik Hertzberg's name that mesquito didn't misspell?! There’s no great mystery about the motives behind this deliberate misnaming. “Democrat Party” is a slur, or intended to be—a handy way to express contempt. Aesthetic judgments are subjective, of course, but “Democrat Party” is jarring verging on ugly. It fairly screams “rat.” At a slightly higher level of sophistication, it’s an attempt to deny the enemy the positive connotations of its chosen appellation. During the Cold War, many people bridled at obvious misnomers like “German Democratic Republic,” and perhaps there are some members of the Republican Party (which, come to think of it, has been drifting toward monarchism of late) who genuinely regard the Democratic Party as undemocratic. Perhaps there are some who hope to induce it to go out of existence by refusing to call it by its name, à la terming Israel “the Zionist entity.” And no doubt there are plenty of others who say “Democrat Party” just to needle the other side while signalling solidarity with their own—the partisan equivalent of flashing a gang sign.